First of all, this is a beautiful Bible. The cover is a lovely turquoise with pink and orange chevron at the bottom and around the spine and back. The inside is beautiful too. There’s quite a bit of pink, but even those girls who are not so girly would love the print, the chevron and the adorable doodles throughout. There are several features of this Bible that make it truly a wonderful option for not only teens, but also college age and beyond. As a 34 year old mom of 5, I found myself thinking that some of the features would really be of benefit to me. 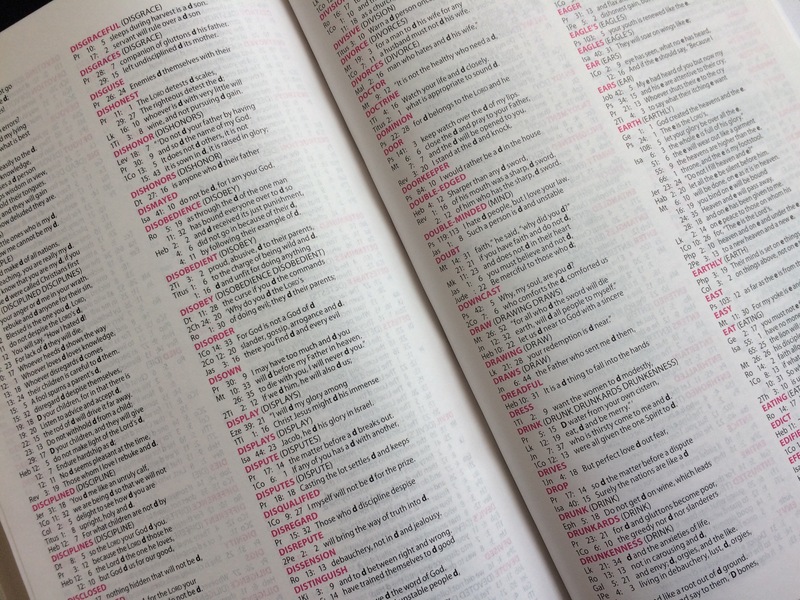 At the beginning of each book of the Bible, there is a “What’s it About” page. I love how concise it is (making my daughters more likely to actually read it) and I LOVE that it contains a “Verses you might recognize” section! What a great idea that was! There’s also a really thorough concordance and an index section at the back. I was immediately impressed at the attention to detail in this Bible – even the font is pretty. Throughout the Bible there are many one page devotionals written by some amazing women (Annie Downs, Christine Caine and Bethany Hamilton just to name a few). I read through several of them and found them to be really appropriate for teens especially. 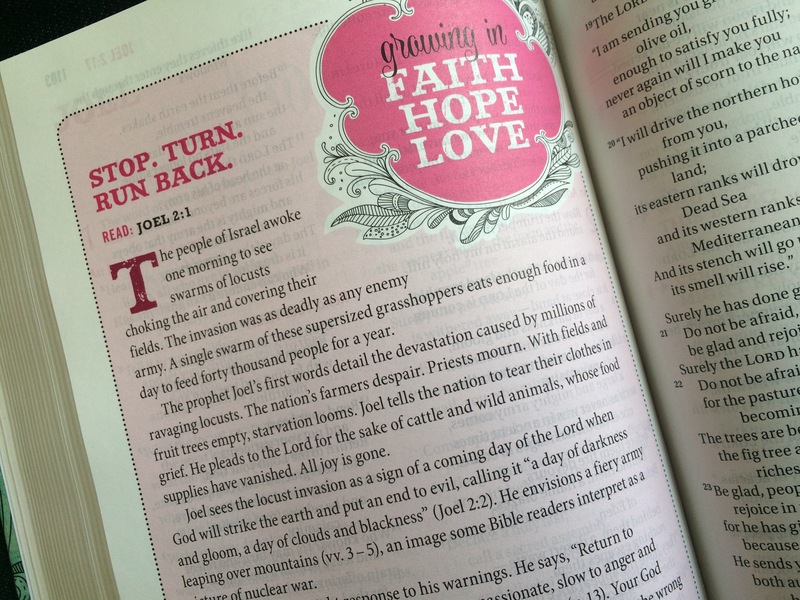 I was also really grateful that they weren’t shallow and surface level devotionals – these are the real deal. They’re written so that teens and young women of all ages will find them to be encouraging and helpful. There are also “Women of the Bible” features, which I absolutely love. The writers even included the meaning of the woman’s name, like Anna (from Luke 2:36-38) whose name means “gracious” or Esther whose name means “star”. 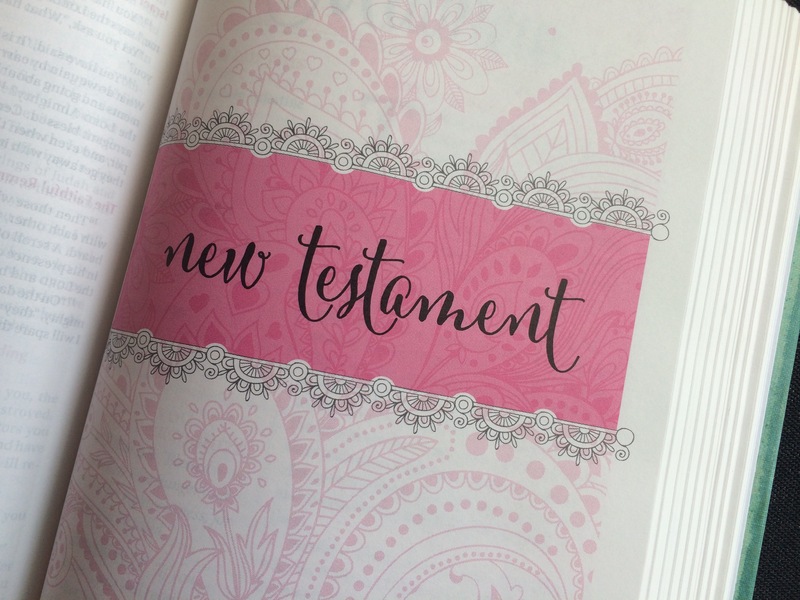 Perhaps my very favorite thing, however, is that the authors chose to highlight (in pink of course) certain verses throughout the Old and New Testaments calling them promises of God or verses worth remembering. 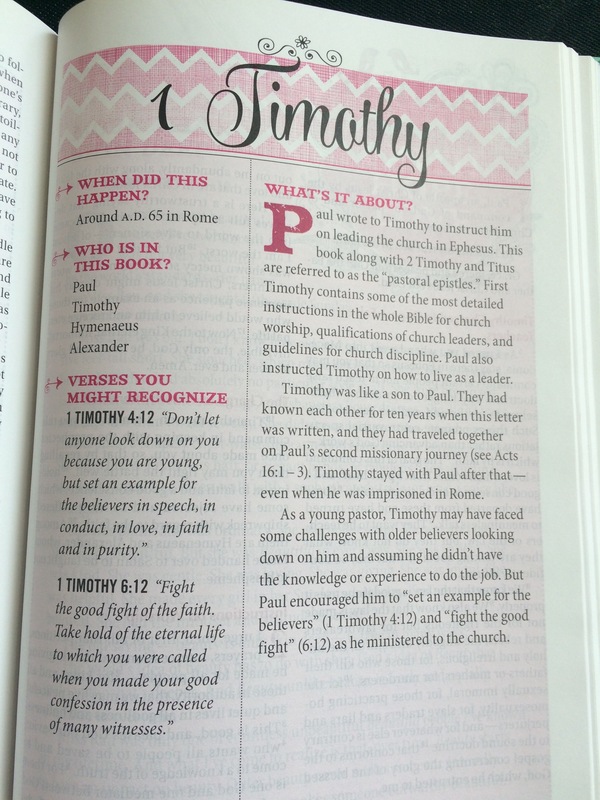 These verses are a great start to helping your teen find verses to memorize. I asked my fifteen year old daughter to look through the Bible and give me some feedback. She said, “This is the kind of Bible that a girl would use until it falls apart.” I think that means she likes it. 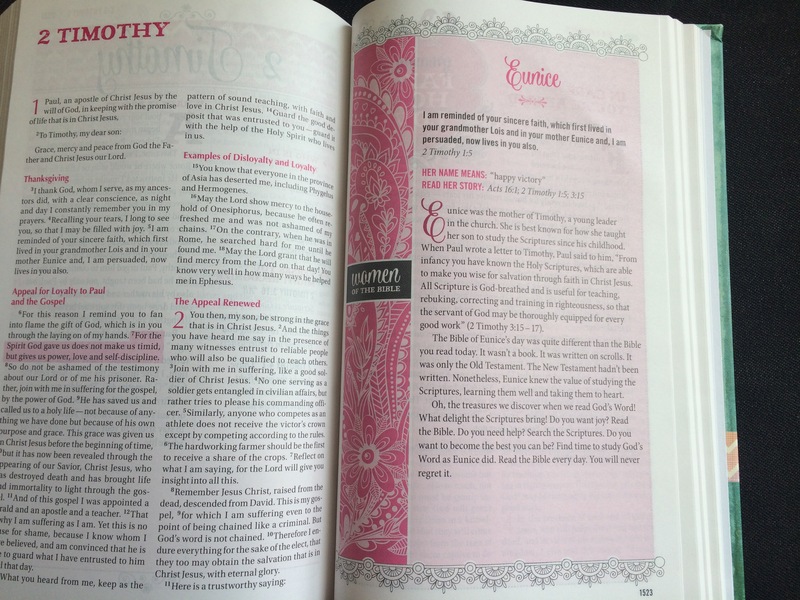 I was so very pleased with this Bible, not just because it’s pretty (although that helps), but for the extra content it provides to help a younger woman to learn how to study and meditate on God’s Word. 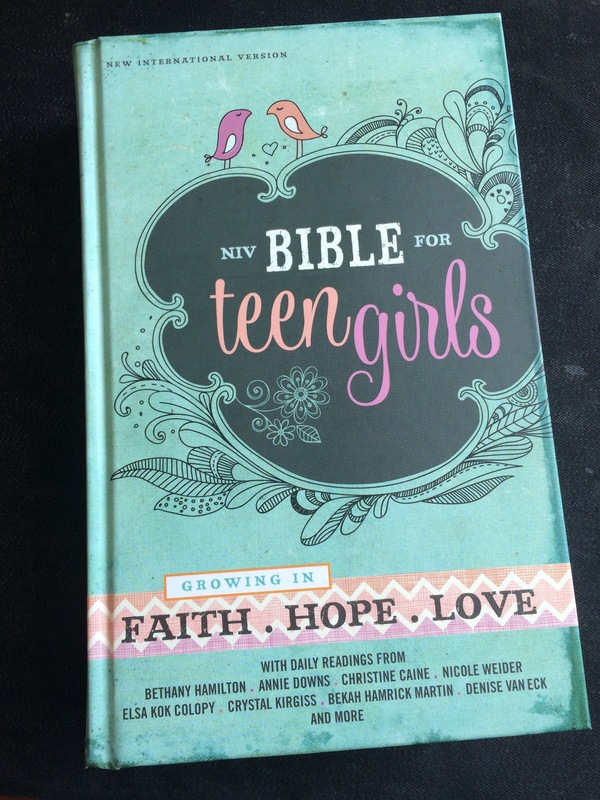 This is a Bible and a devotional all in one and would be a wonderful gift to any young (or not so young) girl.